Rich Deep Bass, On the Go. Delivers thunderous sonic output and powerful low frequency response whenever that will get your heart pumping. Marine Certified. Built to last for cars, boats and ATVs with an IP56 rating and tested for Salt-fog, UV & Humidity. Space Saving Design. Slimmed down form factor reduces the need for oversized subwoofer enclosures for a look that goes virtually unnoticed-but a sound that doesn't. Dynamic Balance Technology. Patented process that guides material selection through rigorous testing that identifies and cancels out unwanted resonant frequencies. 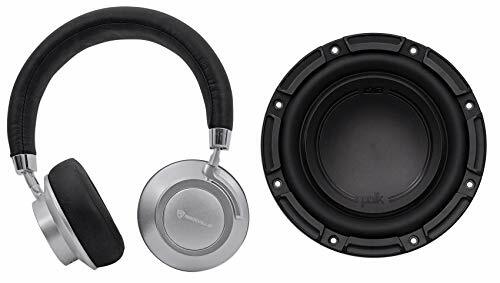 Polk Audio DB842SVC 8" 750 Watt Single 4-Ohm Car/Marine Boat Audio Subwoofer Sub. Driver Compliment: 8" (203.2mm). Cutout Dimensions: 7.28" (185mm). Mounting Height: 0.51" (13.05mm). Mounting Depth (Top): 3.82" (97mm). Mounting Depth (Bottom): 4" 102mm. Peak Power Handling: 750 Watts. Continuous Power Handling: 250 Watts. Nominal Impedance: 4 Ohms. Frequency Response: 30Hz-200kHz. Sensitivity: 84 dB. Magnet Weight: 24.7 oz. Magnet Material: Ceramic. Magnet Size: 110mm x 45mm x 18mm. VC Diameter: 1.5". Minimum Sealed Enclosure: 0.5 cu. ft. Maximum Sealed Enclosure: 1.2 cu. ft. Minimum Vented Enclosure: 0.66 cu. ft. . Maximum Vented Enclosure: 1.2 cu. ft.
Polk Audio DB842SVC 8" 750 Watt Single 4-Ohm Car/Marine Boat Audio Subwoofer Sub . Driver Compliment: 8" (203.2mm). Cutout Dimensions: 7.28" (185mm). Mounting Height: 0.51" (13.05mm). Mounting Depth (Top): 3.82" (97mm). Mounting Depth (Bottom): 4" 102mm. Peak Power Handling: 750 Watts. Continuous Power Handling: 250 Watts. Nominal Impedance: 4 Ohms. Frequency Response: 30Hz-200kHz. Sensitivity: 84 dB. Magnet Weight: 24.7 oz. Magnet Material: Ceramic. Magnet Size: 110mm x 45mm x 18mm. VC Diameter: 1.5". Minimum Sealed Enclosure: 0.5 cu. ft. . Maximum Sealed Enclosure: 1.2 cu. ft. . Minimum Vented Enclosure: 0.66 cu. ft. . Maximum Vented Enclosure: 1.2 cu. ft.
Rockville BTH7 Bluetooth Headphones. Sleek design is fashionable and functional. Perfect sound! Rockville specializes in professional audio products. These headphones are for consumers but deliver similar studio quality sound as our other pro headphones. 180 degrees swivel ear cups (Zinc alloy rotating bar). Thick Leather padding on ear cups and on headband make these very comfortable. Bluetooth version 4.1 with top of the line CSR Bluetooth chipset. This means longer lasting battery, better sound, and no delays. Bluetooth range: 35 feet. 40MM driver. 32 Ohm. Cable included to use the headphones even if your battery needs charging. Speaker sensitivity: 112 + or - 3 dB @ 1 KHZ; 1mW. Frequency response: 20 Hz - 20 Khz. Buttons: Previous song/Volume down, Next song/Volume up, Power/Pause.